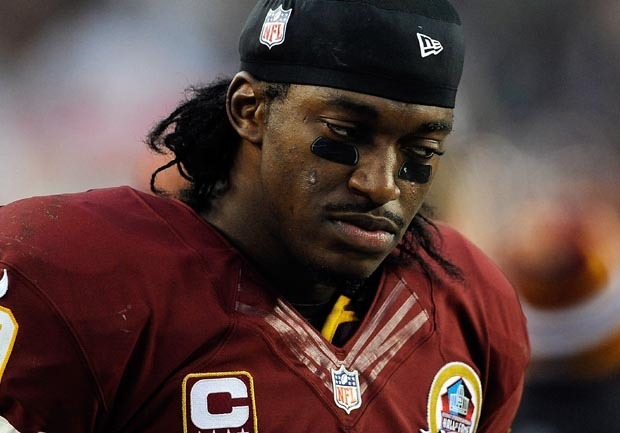 ESPN commentator Rob Parker calls Robert Griffin III a "cornball brother"
When asked at a press conference this week about being an African-American player in the NFL, Redskins rookie sensation Robert Griffin III said he didn't want to be "defined" by his race and said that some fans and sports writers tended to "put you in a box with other African-American quarterbacks." The comments served as a springboard for a discussion Thursday on ESPN's First Take, prompting commentator Rob Parker to pose this query: "My question, which is just a straight honest question: is he a brother, or is he a cornball brother?" The question puzzled the other sports pundits on the show, so Parker tried to clarify what he meant. "Well, [that] he's black, he kind of does his thing, but he's not really down with the cause, he's not one of us," he said. "He's kind of black, but he's not really the guy you'd really want to hang out with, because he's off to do something else." Pressed to further explain his point, Parker continued: "I want to find about him. I don't know because I keep hearing these things. We all know he has a white fiancee. Then there was all this talk about he's a Republican, which there's no information at all. I'm just trying to dig deeper into why he has an issue. Because we did find out with Tiger Woods, Tiger Woods was like, 'I've got black skin, but don't call me black.' So people wondered about Tiger Woods." Parker's comments seemed to baffle and stun the other sports pundits on the segment. Even Stephen A. Smith, who's not afraid to speak his mind on controversial sports topics, said he was "uncomfortable with where we went." Griffin hasn't publicly reacted to Parker's provocative remarks but the quarterback's father did. "He needs to define what 'one of us' is. That guy needs to define that," Robert Griffin II told USA Today. "I wouldn't say it's racism. I would just say some people put things out there about people so they can stir things up. "Robert is in really good shape on who he is, where he needs to get to in order to seek the goals he has in life ... so I don't take offense," RG2 added. Parker has made controversial remarks before. Most infamously, he called baseball legend Hank Aaron a "coward" for declining to be in attendance when Barry Bonds broke his career home run record. A spokesman for ESPN told CBSSports.com that Parker's comments "were inappropriate and we are evaluating our next steps."